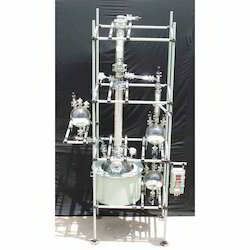 Prominent & Leading Manufacturer from Hyderabad, we offer glass distillation unit for glr and fractional distillation assembly on glr. 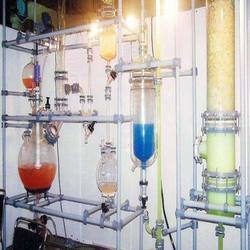 Being the leaders in the industry, we present Glass Distillation Unit For GLR to our clients. The heats exchanges in this unit are available in different types that include coil type and shell and tube type and are widely used in various industries for heating, cooling, condensation and evaporation. It has various advantages over conventional coil type heat exchanges. The glass tubes are sealed individually into PTFE tube sheet with special PTFE sockets and packing. This unique ferrule type sealing arrangement permits easy replacement and cleaning of tubes. Baffles on shell side ensure improved heat transfer by increased turbulance. Further details of construction an be seen in the diagram. Permissible temperature range for both shell & tube sides - 40° C to 150° C.
Maximum permissible temperature difference between shell & tube sides - 120° C. All sizes & models are suitable for full vacuum on both side. The highly experienced team of our company presents Fractional Distillation Unit On GLR of fine quality. It is used in large scale operation of distillation with the use of glass lined reactor as heating media. Various other assemblies like reaction or simple distillation units are installed above glass lined reactors. In this distillation glass shell and tube heat exchanger are used due to large scale production. Looking for Distillation Unit on GLR ?